“There are two types of wine essentially, and everybody knows this. There’s the one where you drink it and go, "Mmmm, well that’s ok, can we get eight of those please, give us eight of those." There’s the other one, you know, where you go "Ga…bt…Jesus, WHAT is that?" But with spirits, 'tain't always that easy. There are lots of different kinds of spirits, distilled from many different things, and the range of flavors is enormous. And there’s been an explosion in the spirits market lately, what with the renewed interest in cocktails: there are more vodkas, rums, gins, whiskeys, than ever. So how are you supposed to figure out what’s what? To separate the plonk from the good stuff? And would the same spirit work in very different cocktails? And, this year brought another changeup: not only was the UCC evaluating spirits on their own, and spirits in various classic cocktails, but this year they also added signature cocktails: recipes that a liquor brand presented to showcase their own spirits. These were judged head-to-head on the basis of which recipes were most appealing and tasted best, but obviously they weren't going to try, say, Old Raj gin in a cocktail specifying Hendrick's. The judges were encouraged to talk among themselves, and the discussion was particularly intense where judges were evaluating different Scotches in otherwise-identical Rusty Nails. Even people like aka wine geek's Steve Olson, who have tasted hundreds of different whiskies, were learning new things and discussing various aspects – smokiness, smoothness, woody flavors – of their favorites. 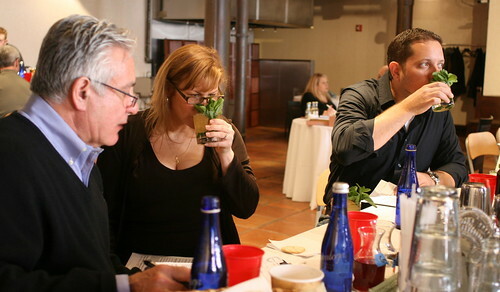 Elsewhere, judges stuck their noses in a succession of mint juleps and talked about what made the ideal bourbon for one. I wasn’t allowed to participate in the official judging, but they still set me up with three gin and tonics (not bad before lunchtime) and a modified judging form so I could see what the judges’ experience was like. But I couldn’t just knock them back and totter off to work: first I had to evaluate each of the drinks (identical but for the gin…right down to the width of the lime-wedge garnish and the number of Kold-Draft ice cubes), and judge how appealing they were visually. I had to take my time and smell them all, and write down my impressions of each. And the tasting was interesting too: there are so many different gins out there that deciding what makes the best gin and tonic means that one has to consider what the Platonic ideal of a G&T actually is. My fellow media judges and I all hated one of the gins right off the bat, and so it was easy to write that one off; its sour pungency meant it was destined straight for the spit cup. But the other two were tougher. One was a classic London dry gin – I had my guesses on what I tasted, but we’ll see if I’m right – and one was softer and lighter, with some vaguely floral botanicals in a New World style. Both were really good, and I wouldn’t kick either one out of my glass on a hot day, but is the ideal G&T one with a dry bite or one with summery flavor? I ultimately went with my favorite – the softer, more floral gin – even though I wouldn’t necessarily pick that same gin for a Martini, or a Negroni, or a Tom Collins. 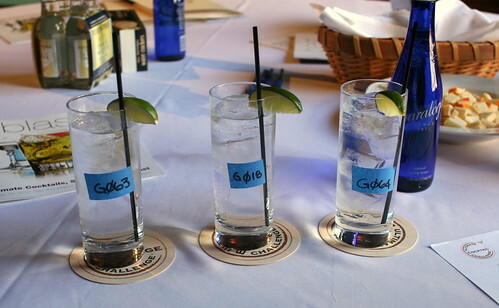 Interestingly enough, of the three gin and tonics I tasted, I couldn't identify any of them -- the London dry that I thought was Beefeater ended up being Tanqueray 10, and made a very nice dry G&T. The middle one, the one that I thought was a New World one like DH Krahn? Good old Plymouth, my go-to standby for gin cocktails. And the one that I hated? In a true surprise, it was Beefeater 24, a gin that I've really liked and often use in mixed drinks. The Ultimate Cocktail Challenge results can be found here, and make for some interesting reading. The results for the signature cocktails are here, and the recipes are included as well. These seem like they'd be a good jumping-off point for some new drinks and ways of thinking about familiar ingredients. My room mates and I derived hours upon hours of private amusement as our friends would come over and wax poetic about our bar stocked with the finest liquor brands. The expensive liquor ran out within the first week of the semester and we refilled with the cheapest rotgut we could find. Not one person ever caught on. College is a special case. College students will drink anything...at least judging from when I was in school.